Special Collections and Archives recently completed preparing several University Archives collections that are now available for research. Notably, the Office of the President, Warren J. Baker Collection, which includes approximately 32 linear feet of records and is one of the first of the University Archives collections to be processed, is now available to researchers. 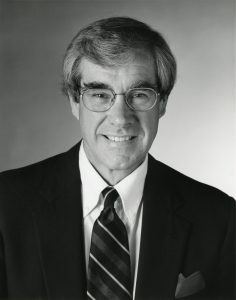 Dr. Warren J. Baker served as President of Cal Poly from August 1979 – July 2010. Prior to his role as president, Baker was a civil engineer and a recognized leader in higher education. 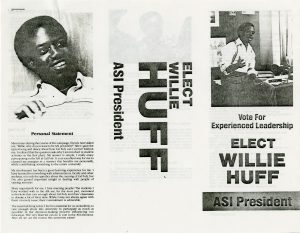 The California State University Board of Trustees named him president on May 22, 1979. The youngest campus president in CSU history, he came to Cal Poly after seven years as a professor and with experience in multiple leadership positions including three years as VP for Academic Affairs at the University of Detroit. Portrait of Cal Poly President Warren J. Baker, 1994. Box 17 Folder 16, UA 0011 Office of the President, Warren J. Baker, University Archives. 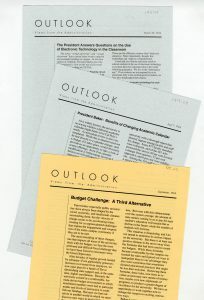 The collection spans President Baker’s 31 years in office and includes records of his work on campus, transcripts and voice recordings of his speeches on and off campus, and his work with the National Science Foundation and with the Board for International Food and Agricultural Development (BIFAD). It also includes presentations relating to the growing demand for online programs and documents relating to Cal Poly’s involvement with Universidad EARTH in Costa Rica. Additionally, the collection contains documents relating to the Baker Forum, WASC accreditation, and Poly Royal; video tapes of commencements; and photographs of multiple campus events such as the Ozzie Smith Plaza dedication. The Baker collection consists of 48 boxes of various sizes containing documents, audio-visual materials, objects, and photographs. The items were received through multiple accessions via transfers to the archives from the Office of the President. The items have been organized, labeled, rehoused, and described in a finding aid. Subsequent accretions may be added to the collection. The finding aid has been published on Online Archive of California (OAC) database where it is available to the public for research access. The collection includes official communications from President Baker’s office to faculty and staff. These documents reveal the day-to-day activities and issues of the administration. Box 11 Folder 1, UA 0011 Office of the President, Warren J. Baker, University Archives. The collection also includes records created by students, staff, and faculty, including this campaign leaflet for ASI candidate Willie Huff, who was elected ASI President for the 1981-82 term. Box 11 Folder 46, UA 0011 Office of the President, Warren J. Baker, University Archives. In addition to the Baker Collection, the following University Archives collections have been processed and are now available for use on campus. The University Archives serves as the institutional memory of Cal Poly. The department acquires and maintains records of value that document the development of the institution and support its academic programs and services. Materials selected for preservation include meeting minutes, correspondence, university and student publications, reports, buildings plans, photographs, audio tapes, digital documentation and digital media. Materials that provide for teaching, research, and documentation of university activity are also included. Historic and contemporary materials preserved in the archives can provide answers to questions regarding the history, policies, procedures, and decision-making processes of Cal Poly and its academic and support programs and services. Archival collections are representative of university administration, staff, students, alumni, visitors, and faculty. The University Archives also includes collections related to the Baker Collection. 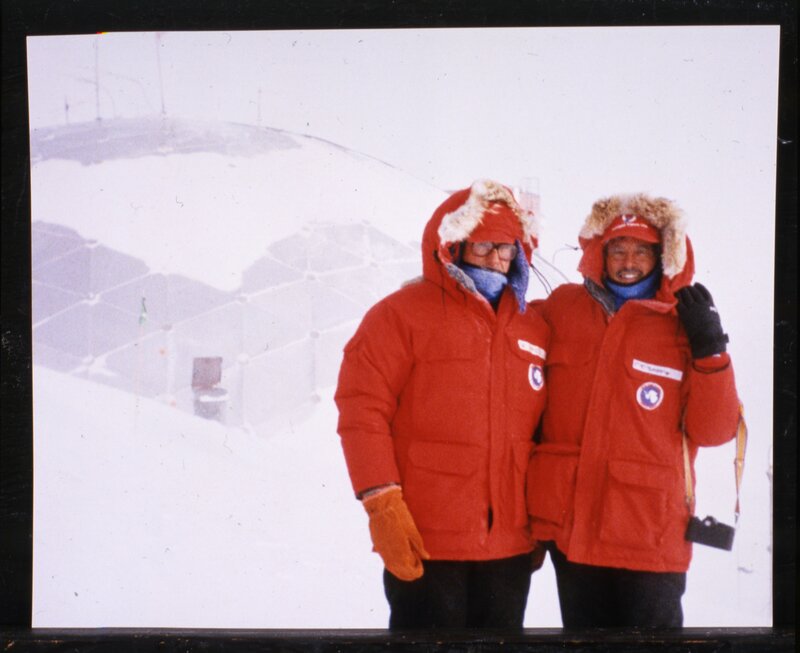 This photo came from the Public Affairs collection, for example. President Baker (left) traveled to McMurdo Station in Antarctica in 1991 to take part in the dedication of the National Science Foundations Science and Engineering Lab, designed by architecture alumnus Christopher Smith. UA-pho_00001713, University Archives. With the placement of a processing archivist in the department last year, Special Collections is now in the process of surveying holdings and prioritizing collections to be made more readily available for research. Backlogs of unprocessed materials in archives are typical, but do not have to limit access. The goal is to publish brief descriptions of collections to provide for greater access and use while concurrently implementing preservation practices to ensure longevity. The newly published University Archives collections, including the Baker collection, are some of the first results of the department’s efforts. Presidential papers and records of campus buildings and facilities are top processing priorities. Department records and student activity club records that reflect campus life have also been selected for priority processing. Guides to these collections are available via the Online Archive of California (OAC). The collections are available for research in the Robert E. Kennedy Library Special Collections and Archives by appointment. For more information about collections available in the archives or to make an appointment contact: ude.yloplacnull@sevihcra or 805.756.2305. Read more on Berlin Loa, cal poly, cal poly history, special collections and archives, and university archives.